It is also worth examining the Wikipedia article entitled Rail In The United States for more background. The U.S. may be the land of the car, but it also one of the greatest countries in the world to be explored by passenger train. There are a number of private operators who offer exclusive and luxurious packages on private passenger trains, but it is onboard the trains of the state owned and subsidized Amtrak  that most tourists and travelers experience America by rail. Before setting out on a railroad adventure around America, it is worth understanding the precarious situation in which Amtrak exists today. Somewhere between being a private and a public company (all of Amtrak's preferential shares are owned by the U.S. Government) Amtrak has to provide both a public service and seek to remain profitable as a competitive mode of transport. Furthermore, Amtrak was organized to handle intercity passenger trains in the USA. Municipalities, or regional government entities, operate commuter trains. At present, Amtrak is the only operator of regularly scheduled intercity trains in the USA. Despite increasing ridership (driven by rising gasoline prices and the increasing inconvenience of airline security measures), Amtrak is dependent on more than a billion US dollars per year in hard-won government funding. Amtrak's financial situation is not its only problem. While tens of thousands of kilometers of railroads criss-cross the North American continent, virtually all the lines that Amtrak uses are owned and maintained by private freight companies. While Amtrak has a legal right to be given priority over freight trains, in many instances Amtrak services are disrupted due to freight trains which have been given priority over them. Many rail lines are not double-tracked, and passing places are often few and far between. With the exception of the Amtrak-owned-and-maintained Northeast Corridor (between Boston, New York City, Philadelphia, Baltimore, and Washington, D.C.), and some services in Pennsylvania and around Chicago, Amtrak services are substantially slower, less reliable, and less frequent than those of virtually every other developed nation in the world. And yet they remain popular with many travelers because of the social atmosphere on board, the lighter environmental impact compared to planes, the spacious design of the cars, the scenic routes, and the overall comfort of the train ride. With few high-speed lines, trains in the U.S. often take longer than cars or planes, but the unique experience can trump the long ride. A trip from one coast of the U.S. to the other is surely one of the greatest railway journeys that you can make anywhere in the world, and with the different classes of on-board accommodation and a variety of tickets and passes available, it can also be remarkably affordable. Amtrak, +1 800 USA-RAIL (872-7245), . Amtrak is the quasi-state-owned passenger railroad company of the U.S.. Amtrak operates services over some 35,000 km (22,000 miles) of track, serving more than 500 communities in 46 American states and even 3 provinces of Canada. Trains carry one or more classes of accommodation: coach, business, and sleeper. Coach class is generally competitive in price with Greyhound bus, while sleeper accommodation may be competitive with the price of an airline ticket; however this depends on the route, and the case may be a coach ticket is more comparable to a plane ticket, while a sleeper costs even more. Most of the information in this article relates to Amtrak. The other long distance train company is Alaska Railroad  which runs from Seward through Anchorage, Denali, and Fairbanks to North Pole, with spurs to Whittier and Palmer. The railroad is famous for its summertime passenger services but also plays a vital part in moving Alaska's natural resources--primarily coal--to ports in Anchorage, Whittier and Seward as well as fuel and gravel for use in Anchorage. The Alaska Railroad is the only remaining railroad in North America to use cabooses on its freight trains. The route between Talkeetna and Hurricane (between Talkeetna and Denali) features the last remaining flag stop train service in North America. A stretch of the track along an area inaccessible by road serves as the only transportation to cabins in the area. Residents board the train in Talkeetna and tell the conductor where they want to get off. When they want to come to town, they wait by the side of the tracks and "flag" the train, giving it its name. Many large American cities have commuter rail systems that connect the suburbs with that metro area's central metropolis. Commuter lines can be a great way to get out of the big city for a day or weekend trip. Many systems allow bicycles to be taken on board during weekends. In the American Northeast several commuter rail systems converge and are inter-connected. It is possible, for example, to go from Connecticut to New York to Philadelphia to Delaware, using only commuter lines, although this would take much longer than on Amtrak. MBTA Commuter Rail (Massachusetts Bay Transportation Authority), . Eleven lines radiating out of Boston, serving much of eastern Massachusetts, with one line extending south into Rhode Island. Metro-North Commuter Railroad, . The Metro-North has two very busy commuter lines, extending from New York City's Grand Central Station north to upstate New York, and one line going into Connecticut. Service is very frequent during rush hours, with hourly service on weekends. Watch for special summertime promotions to weekend destinations. Long Island Railroad, . Service to many points on throughout Long Island, including well know beach resorts such as Montauk. PATH (Port Authority Trans Hudson), . Service from several underground stations in Manhattan to Jersey City and Newark, New Jersey. New Jersey Transit, . Eleven train lines extending throughout New Jersey, including to Newark Airport, Trenton, Atlantic City, Princeton University, Camden, and Philadelphia, PA.
SEPTA (Southeastern Pennsylvania Transportation Authority), . Service within and around the greater Philadelphia area, including to Philadelphia International Airport. Lines extend as far as the state of Delaware. MARC (Maryland Area Regional Commuter), . Several lines extending north from Washington, DC to Baltimore and well beyond, including to West Virginia. Limited service on weekends. VRE (Virginia Railway Express), . Two lines extending south from Washington, DC into Virginia. No service on weekends. Metra, . Eleven lines radiating out from Chicago, serving much of the Chicago metropolitan area in northeastern Illinois, with one line extending into southern Wisconsin. South Shore Line, . A single line running along the south shore of Lake Michigan, from Chicago to South Bend, Indiana. Amtrak California  are state subsidized intrastate Amtrak routes within California. The intrastate routes are the Capitol Corridor (San Jose, Oakland, Richmond, Sacramento, & Auburn), San Joaquin Express (Oakland or Sacramento, Stockton, Fresno, Merced, Bakersfield); and the Pacific Surfliner (San Luis Obispo, Santa Barbara, Oxnard, Burbank, Los Angeles, Orange County, San Diego); and the intrastate Amtrak Thruway buses connecting more cities and town to the Amtrak trains. ACE (Altamont Commuter Express)'  goes up from San Jose to Santa Clara and over to Stockton through the Altmont Corridor. Nearest connection to BART is from the Pleasanton station. Trains go to San Jose in the morning and out to Stockton in the afternoon. BART, . BART provides frequent service from San Francisco, Richmond and Oakland to several suburbs, and provides connections to Amtrak trains at the Richmond station. Caltrain, . Caltrain runs approximately hourly between San Francisco and San Jose stopping at several cities in Silicon Valley (between San Francisco & San Jose). During rush hour, more frequent, and express service is provided, as well as service to Gilroy . The San Jose Minteta International Airport is at the 'Santa Clara' stop. From there passengers continue on the #10 bus. Connects to BART at the Milbrae stop (which includes a stop at San Francisco International Airport). Capitol Corridor  runs frequent trains between San Jose, Hayward, Oakland, Richmond and Sacramento. Metrolink, . Metrolink connects Union Station, the hub of the Los Angeles subway and light rail system, to many suburbs and cities in Orange, Riverside, San Bernardino and Ventura counties on multiple routes. Coaster, . Goes north from the downtown Santa Fe Station in San Diego to Oceanside in the northern suburbs. Cross platform transfers to the Amtrak Surfliner are at least in Oceanside, Solana Beach and the downtown San Diego. At other times cross platform transfers or shared stops with Amtrak are available in Carlsbad Village, Carlsbad Poinsettia, Encinitas, Sorrento Valley and San Diego Old Town. Transfer to the Metrolink trains are only at Oceanside. Music City Star  runs a short 32mi/51km trip between Nashville & Lebanon, TN. New Mexico Rail Runner  travels 97mi/156km between Belen, Albuquerque, & Santa Fe. Connects to Amtrak & Greyhound at the downtown Albuquerque Alvarado Stop. Tri-Rail,  connects Miami, Fort Lauderdale & West Palm Beach in South Florida. Transfers to the Amtrak Silver Service & Palmetto are at W. Palm Beach, Delaray Beach, Deefield Beach, Ft Lauderdale, Hollywood, & Tri-Rail/Metrorail Transfer Station. Serves the area airports to the Miami-Dade Airport from the Miami Airport/Hialeah Market Station (south end of the line); Ft Lauderdale/Hollywood Airport station and the W Palm Beach Station. From the airport stations a shuttle bus is available to continue to the airport terminals. Trinity Railway Express (TRE),  runs between Ft Worth and Dallas, TX. Connects the DFW airport at the Centerpoint station. UTA FrontRunner,  runs along the Wasatch Front between Pleasant View, UT (north end), Ogden, Salt Lake City & Provo (south end) with a total length of 88 miles (142 km). Connects to Amtrak & Greyhound at the downtown Salt Lake City Station. Plans are underway to extend the route north from Pleasant View to Brigham City and south from Provo to Nephi. Throughout the US, there are many heritage lines or tourist trains that have been maintained or rebuilt as privately owned, touristic lines, which occasionally connect to Amtrak or regional systems. Most of these lines use old train equipment (such as steam locomotives) which have been refurbished. Also, many medium to large cities have their own subway or light rail system for local travel within the city. The peak periods for most rail companies in North America is somewhere between April to September, and the cost of rail passes and tickets will rise during these periods to reflect this. If you're planning a visit to the U.S. and travel a lot by train, the spring and fall (autumn) periods are likely to give you the best combination of lower ticket prices and hours of daylight for viewing the scenery from the train. Trains fill up much quicker in the summer and around national holidays, and coach class passengers in particular will have less room to stretch out. All the major rail operators in the U.S. have websites with information about timetables, routes and on-board facilities. However many passengers still prefer to plan their trips using printed timetables. Amtrak, for instance, publishes a number of brochures, including the Amtrak System Timetable (with timetables for every Amtrak train and Thruway bus) and the Amtrak America travel brochure. These can be found at most staffed stations, or can be ordered free of charge for worldwide delivery online . Individual pamphlet timetables are also published for every route. If you are planning more than one journey on an Amtrak train, you may be better off investing a rail pass, which allows unlimited rail travel within a certain period and area. You should, however, compare the cost of individual tickets when pricing and planning your trip. The USA Rail Pass  The pass divides the U.S. into zones, and the pass may be bought for one or more zones. Restrictions apply. Americans can now purchase this pass, though Amtrak did not publicize this change. The California Rail Pass  This pass offers seven days of travel within any 21-day period on most California trains. Amtrak tickets can be purchased in person from any staffed Amtrak station, over the phone (1-800-USA-RAIL in the U.S. and Canada) or on the internet . A number of travel agencies that sell Amtrak tickets in other countries are listed on the Amtrak website. Tickets for most routes are priced in incremental 'buckets': in other words, as seats on a train sell out, the remaining tickets become more expensive. When buying point-to-point tickets, especially during busy holiday periods, it is important to book in advance. Round-trip (return) tickets are priced by simply adding together the two cheapest available one-way fares. On many routes, tickets can also be purchased by credit card on board the train at peak prices. Discounts are also offered to active members of the military, war veterans, senior citizen, and students. American students should purchase a Student Advantage  card; all other students should purchase an International Student Identity Card  (ISIC). In all cases, you should quote your membership number when booking your ticket, and show your card with your ticket. To obtain a discount on Amtrak trains, passengers must reserve three days in advance on all trains. Amtrak offers heavily discounted coach fares on certain trains on the 'Hot Deals Weekly Specials' section of their website . These non-refundable and non-changeable fares are generally available for travel in the next thirty to sixty days on routes that have spare capacity. The page is updated every Friday, and you should check back regularly if you want to snap up a bargain. Long distance coach fares of $70 from Chicago to Seattle (for example) are not uncommon, although they become much less common during the more popular summer months. These fares cannot be upgraded to sleeper accommodation at the time of booking, although you may be able to upgrade to a sleeper if one is available after you board the train. Since 2005, Amtrak's offering of many of these heavily discounted coach fares has been limited by language in the legislation which grants Amtrak a yearly subsidy. However, this legislative language does not affect routes that receive a subsidy from individual states. Accordingly, those train routes tend to appear frequently on the 'Hot Deals' page of the website. For frequent Amtrak travelers or those planning ahead for a big trip, Amtrak's loyalty program, 'Amtrak Guest Rewards' allows redeeming points for Amtrak tickets. Some one-way redemptions require as little as 1,500 points per ticket in coach. There are several popular credit card programs that allow transferring points into your Amtrak Guest Rewards account, including Amtrak's own co-branded credit card. Tickets booked with Amtrak Guest Rewards Points have the advantage of being more flexible than many classes of Amtrak tickets purchased with cash and are often a good deal for last minute ticket purchases. Amtrak tickets generally do not indicate a coach or seat number, merely that you have a place in a reserved coach. Pay close attention to announcements and station staff, who will tell you where to wait and board the train. Attendants will need to see your ticket and/or pass as you board the train, and they will direct you towards the carriage you should sit in. In some cases, your ticket may show a seat reservation number and a carriage number. If this is the case, the numbers of the carriage are displayed on the doors; pay attention to these as the trains rolls in, so you can be at the right spot on the platform in time to get into your carriage. Some stations have indicators on the platform to show where each carriage will stop. If you have a specific seat number on your reservation, you are advised to occupy it. Otherwise, follow the directions of the conductor who checks your ticket, and once on board your coach, you may select your own seat. Once you find your seat, you will want to stay there until the conductor comes by to check your ticket after departure. Upon doing so, the conductor will place a seat check (a small piece of paper) above your seat, to indicate that the seat is occupied. Take this with you if you decide to change seats, especially if you are leaving the train en route, because this piece of paper carries a station code to help the conductor let you know when your stop is imminent and shows you have given a ticket to him/her already. The information here relates specifically to services operated by Amtrak. Private train companies and commuter rail services will offer differing standards of on-board facilities. Coach (economy) is Amtrak's most affordable class of travel and is offered on all trains except the high speed Acela Express trains of the north-east corridor (between Boston, New York City, and Washington DC). A ticket in coach guarantees you a seat in a carriage with fifty-eight to seventy-five other seats, arranged in pairs either side of the aisle. Seats can be arranged in facing sets of four, but in almost all cases you will find that seats will all face the direction of travel. Luggage racks and spaces for larger items are provided, along with toilets either at the end of the coach or in the lower level of two-level trains. 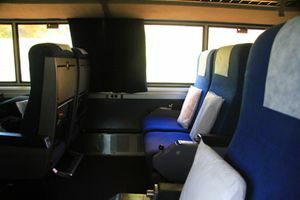 An Amtrak coach class seat is roughly comparable with a business class airline seat: there is ample leg room, a reclining seat back and fixed armrests on the outside of each pair of seats. If there is a seat in front of you, a fold-down table will be available. On longer distance routes, there is more legroom as well as a deeper recline and a padded rest that folds up to support your legs when you recline. Business class is offered on most trains where there is no First (sleeper) accommodation. Seats are arranged in pairs to one side of the aisle, and singly on the other side of the aisle (called '2+1 seating'). There is more room than coach class, as well as an at-seat attendant service with complimentary refreshments and a newspaper. Long-distance trains that travel overnight generally do not offer business class; sleeper class is available instead. The only first class service offered by Amtrak that does not include a sleeper is found on the Acela Express trains along the northeast corridor. These trains offer only First and Business class service. First class includes complimentary at-seat meals. First class accommodations are priced in addition to the lowest available coach fare, and are priced in incrementally priced 'buckets' according to availability. As each 'bucket' of rooms sells out, the price goes up. It is worth noting, however, that after an Amtrak train departs its originating station, if there are any sleeper accommodations still available on the train, they revert in price to the cheapest originally available price. For example, if a train has one remaining room available prior to be departure, it would be priced in the most expensive 'bucket'. Once the train leaves, however, a coach passenger on-board the train can approach the conductor and upgrade to the sleeper for the price the room would have been when it first went on sale. 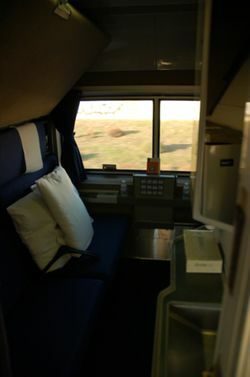 Amtrak operates two types of sleeper carriage: the precise standard of accommodation that you will have depends on the type of train you will be riding on. Check the timetable or Amtrak website to discover which sort of train you'll be riding on. Built in the late 1970s. Used on short-distance trains in the East. May be found elsewhere. Decently comfortable seating. Built in the early 1980s. Used on long-distance trains in the East, very rarely found elsewhere. Amfleet II Coaches are Amtrak's most comfortable coaches. Cars from the 1990s that have two rows of windows. Most are Sleepers. Very comfortable. The Viewliner IIs were delivered starting in 2013, they have some modifications. First batch from 1978-1981, second batch from early 1990s. Used on long-distance trains in the West, may be found elsewhere but they never run into New York. Sometimes found on short-distance trains. Very comfortable Coaches and Sleepers, famous Sightseer Lounge Cars. Superliner Is are slightly better than IIs. Built 1988-1989. Used on short-distance trains in the Midwest, may be found elsewhere. They were built as improved versions of Comet commuter cars, thus they are not very comfortable. Old railcars passed down from predecessor railroads, they only run as Dining and Baggage Cars. All from the 1950s. The Diners are only used on Eastern long-distance trains but the baggage cars are found across the entire system. Accessible Bedrooms should only be booked by those with reduced mobility or a physical disability. Family Bedrooms and Accessible Bedrooms are located on the lower level of the Superliner carriage. While there are no actual limitations, accessible Bedrooms should only be booked by those with reduced mobility or a physical disability, and family bedrooms should only be booked by families traveling together. Interior of a Superliner Lounge Car. On the shortest of journeys, Amtrak offers an at-seat trolley service of drinks and light refreshments. On most journeys however, there will be a dedicated café or lounge car that offers a marginally broader selection of hot and cold drinks and refreshments, although all snacks will be pre-packed and all hot snacks will be microwaved. Café and lounge cars offer an open area of seating around tables that will be open for most of your journey. However, travelers are advised that, while lounge car seating is open to everyone, the café car attendant may restrict café car seating to those who purchase café car food and beverages. On almost all long distance trains, Amtrak offers a dedicated dining car, that will be open for breakfast, lunch and dinner. In an effort to cut costs, Amtrak has implemented its "Simplified Dining Service" where meals are generally prepared off the train before departure and then reheated and plated on-board. During lunch and dinner service, for example, customers are presented a preprinted menu with a selection of a couple of appetizers, about six entrees, and few dessert items. Menu items ordered are served on disposable plates and cups, as are the napkins and tablecloths; cutlery and wine goblets are, however, fashioned of steel and glass, respectively. The Amtrak Lead Service Attendant, or LSA in Amtrak-speak, who runs the dining car will seat travelers together to fill a table, instead of assigning individuals or couples to a table by themselves (however, the LSA will seat a family together). This practice tends to surprise those unfamiliar with it. In many cases, a traveller will find an interesting conversation happening that would never come about otherwise. As mentioned above, all meals (but not alcoholic beverages) are included in sleeper tickets. Coach passengers can pay according to the menu. Per meal, the breakfast menu is the cheapest and dinner is the most expensive. Reservations are required for lunch and dinner; after boarding the LSA will travel through the train taking reservations. Reservations are handled in time increments, so during meal time the LSA will periodically announce when each group of reservations will be served. Many seasoned travelers bring their own snacks with them on the train, and then supplement them with the odd item from the lounge or café car. With the exception of sleeper passengers who consume them in their own cabins, passengers are not allowed to bring their own alcohol on board any Amtrak train. Unfortunately delays are common on long-distance Amtrak routes. This is because private railroads own the tracks used by Amtrak, and they are more concerned about their own freight trains than about Amtrak's passenger trains. Average delays vary considerably among routes. You can check historical on time performance on the Amtrak website  which will give you on time percentages for the current calendar month and 6 months, as well as on time percentages for each individual train for the current calendar months and last 6 months as well. Amtrak offers 34 passenger train routes. These are some of the most popular routes offered by Amtrak, selected because of popular destinations they serve or because they travel very long distances. Additionally, historic routes like the Empire Builder were listed not only because of the destinations, but also because of the legacy of these routes left on tourism in North America. 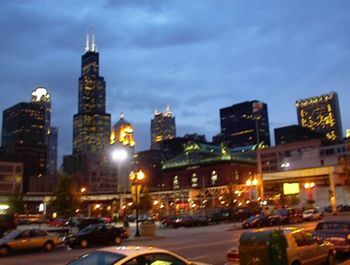 Chicago is the long-distance rail center of America, many routes converge on the Windy City and could require a passenger to change trains here, when traveling cross country. However, New York is the most popular railroad opportunity in the country, with a high commuter ridership and its possession of the most-used Amtrak station. Acela Express, . The Acela Express takes you from Boston, Massachusetts to Washington, D.C. via New York and Philadelphia, Pennsylvania. This is the only route in the country which resembles a high-speed rail line, with a top speed of 150 mph (241 km/h). There are multiple daily departures. Length of ride is seven hours. Amtrak Cascades, . The Amtrak Cascades takes you from Eugene, Oregon to Vancouver, British Columbia via Portland, Oregon and Seattle, Washington. This route uses a distinctive Talgo trainset in lieu of the Superliner consist. There are multiple daily departures. There are now two trains running between Seattle and Vancouver; one ends in Seattle, the other continues on to Portland. California Zephyr, . Amtrak's California Zephyr travels from Chicago, Illinois to Emeryville/San Francisco (San Francisco is a short bus ride from Emeryville) via Omaha, Nebraska; Denver, Colorado; Salt Lake City, Utah; and Reno, Nevada. Service is daily and takes 51 1/2 hours to complete. Capitol Limited, . Runs from Chicago to Washington, D.C. via Cleveland, Ohio and Pittsburgh, Pennsylvania. Service is daily and takes 18 hours to complete. Cardinal, . The Cardinal connects New York City with Chicago; via Washington, D.C. and Cincinnati, Ohio. The train operates three days a week and is a 26 1/2 hours trip. Recently, Amtrak has upgraded the food service available on this train with a "Diner-Lounge" car. 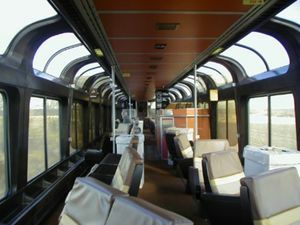 "Diner-Lounge" cars are being tried by Amtrak owing to US Congressional mandates to reduce the losses incurred by providing food service on intercity passenger trains. Carolinian, . Travels from New York City to Charlotte, North Carolina; via Philadelphia, Pennsylvania and Washington, D.C.. Service is daily and takes 13 1/2 hours to complete. City of New Orleans, . This route takes you from Chicago, Illinois to the "Birthplace of Jazz" — New Orleans, Louisiana; via Memphis, Tennessee. The ride is 19 hours long and operates daily. Coast Starlight, . Runs from Los Angeles, California to Seattle, Washington via Santa Barbara, California; San Jose, California; Emeryville, California (a short Amtrak bus ride from San Francisco); Sacramento, California; and Portland, Oregon. Although the moniker is "Coast Starlight", the coast is visible for only a short while between Los Angeles and San Luis Obispo. Service is daily and takes 35 hours to complete. Crescent, . The Crescent runs from New York City to New Orleans, Louisiana; via Philadelphia, Pennsylvania; Washington, D.C.; Charlotte, North Carolina; and Atlanta, Georgia. Service is daily and takes 30 hours to complete. Downeaster,  The Downeaster runs from Boston, MA to Brunswick, ME with stops in Woburn, Haverhill, Exeter, Durham, Dover, Wells, Saco, Old Orchard Beach, Portland, and Freeport. Multiple trains every day and takes about 3 hours the whole way. Empire Builder, . The Empire Builder runs from Chicago to either Portland, Oregon; or Seattle, Washington via Milwaukee, Wisconsin, Minneapolis, Minnesota, and Glacier National Park. This route operates daily and is a 46 hour ride. The Empire Builder was the single most-ridden Amtrak train in 2004, 2005, 2006, and 2007. Over 503,000 people rode this train in FY2007, which ended September 30, 2007. Lake Shore Limited, . Runs from Chicago to either Boston, Massachusetts or New York, via Cleveland, Ohio and Buffalo, New York. Runs daily and takes 19 1/2 hours (Chicago-New York) or 22 hours (Chicago-Boston). Pacific Surfliner, . Runs from San Luis Obispo, California to San Diego, via Los Angeles and Orange County. A perfect way to beat the Southern California traffic. Also great for visiting Disneyland. There are multiple departures every day. It takes 2 hours 45 minutes from San Diego to Los Angeles, 2 hours 45 minutes from Los Angeles to Santa Barbara, and 2 hours 30 minutes from Santa Barbara to San Luis Obispo. Palmetto / Silver Meteor / Silver Star . Three different trains which travel from New York down the eastern coast. The Palmetto travels from New York City to Savannah, Georgia; via Charleston, South Carolina. The Silver Meteor travels from New York City to Miami, Florida; via Charleston, Savannah, and Orlando, Florida. The Silver Star follows essentially the same route as the Silver Meteor, except it takes a different route through the Carolinas and makes a detour to Tampa, Florida. All three trains run daily, and the length of the trip is up to 28 hours. Southwest Chief, . The Southwest Chief travels from Chicago, Illinois to Los Angeles, California; via Kansas City, Missouri and Albuquerque, New Mexico. Service on the 40-hour route is daily. Sunset Limited, . Travels from New Orleans, Louisiana to Los Angeles, California via San Antonio, Texas. Service is three times a week and is 48 hours from start to end. Texas Eagle, . Travels from Chicago, Illinois to San Antonio, Texas; via St. Louis, Missouri, and Dallas, Texas. Service is daily and takes 32 1/2 hours to complete. Three days a week, the train continues to Los Angeles. Vermonter, . Daily service from Washington D.C. to New York, New Haven, and St. Albans in Vermont. It is a very scenic route and traverses Vermont. From St. Albans, it is only a short bus ride to Montreal. This page was last edited on 3 January 2019, at 22:53.